Legator's Ninja body style was born to shred, with sleek lines and a speedy, ultra-thin neck carve. Paying tribute to metal history while looking towards the future, the Ninja 6 Performance Multi-scale, adds the ergonomic and playability advantages of optimum string tension and shifting fret angles that match your wrist rotation to Legator's proprietary monorail bridge and powerful alnico humbuckers, with an exceptionally lightweight body graced with a maple burl top. The ultra-slim, fast, 25.5–27"-multi-scale maple neck and smooth ebony fingerboard helps make it a stunning choice for the studio or for the road. 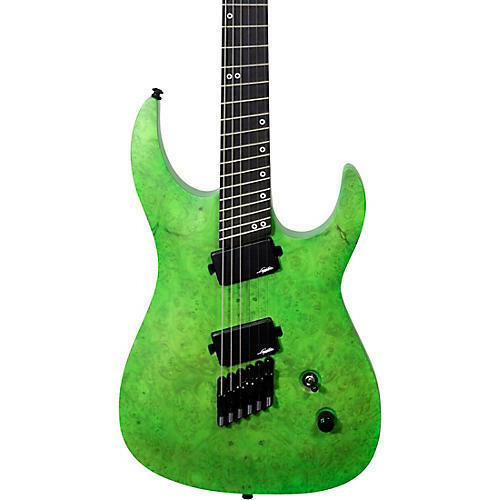 Scale length: Multi-scale 25.5–27 in.